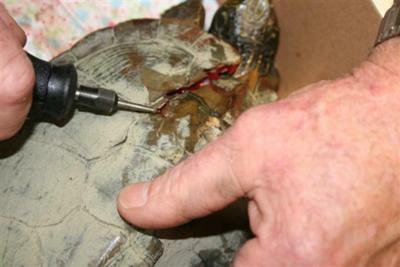 Map Turtle hit by car! Mrs Map Turtle was crossing the road to lay her eggs and a car ran over her. We found 4 gravid eggs by the road. We placed a dot on the top of each egg, thus we knew where the egg air sac would develop. This dot has to be kept up or the egg will suffocate. We dremelled the fractures down, washed them with soap and water, rinsed with rubbing alcohol and dried the edges with a cool hair dryer. Equine Thane or Adhere Hoof Repair was applied under pressure to the fractured edges. These were dried and the green material was applied. The turtle will be kept in my greenhouse for a day or two. 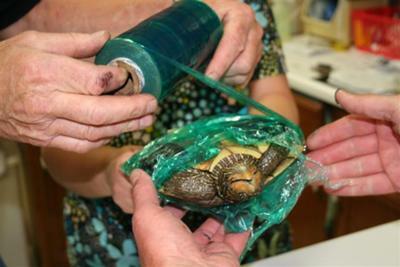 I will then remove the green cellophane and release her to the wild. 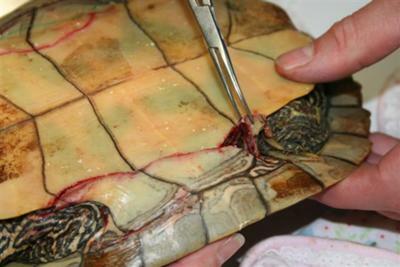 For an update on the condition of Mrs Map Turtle, click this link!